Tuesday through Sunday and national holidays* from 10.00 to 17.00 hrs. The sculpture garden is open until 16.30 hrs. Tip for peace seekers: Friday is usually the quietest day to visit. Monday and on 1 January. The museum has a free, guarded cloakroom and secure lockers in which to store handbags, rucksacks, and any other luggage. 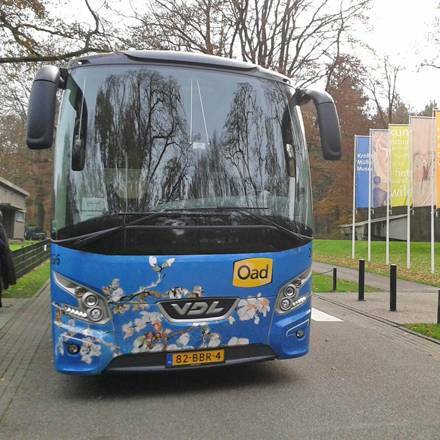 The museum is situated in the middle of De Hoge Veluwe National Park. Therefore, museum visitors also pay an entrance fee for the park. This also applies to visitors with a Dutch Museumkaart. *You must show your student card/university ID. Groups of 20 people or more receive a 10% discount. The group discount is given automatically when you buy your tickets online. Click here to arrange your school visit. With a CJP or student card, you get a discount only at the reception desk of the Hoge Veluwe. There are special rates for primary and secundary schools. For DMCs, (outbound) tour operators, FIT suppliers.